Type 2 diabetes is raging out of control around the world. It is the fastest spreading medical condition of our time. Currently, it affects more than 10% of the world’s population – and by the end of this decade (just seven short years from now), it will affect one-in-three people. It used to be a condition that only affected the elderly, but Type 2 is now afflicting children at an alarming rate. Kids as young as nine-years-old are already stricken with diabetic complications, such as high blood pressure, artery disease, obesity and kidney problems. Because of Type 2 diabetes, children born after the year 2000 will be the first generation in human history to have a shorter lifespan than their parents. Friends, this is a very serious health problem — and doctors seem powerless to stop it. But there is a simple solution to Type 2 diabetes that involves improving one’s diet and lifestyle. This solution requires no doctor bills, no drugs and no medical interventions. And this do-it-yourself diabetes solution appears to be much more effective than the medical treatments currently being administered by doctors these days. Today, I am dedicating this blog post to everyone who has Type 2 diabetes — and to your family members, loved ones and friends who want to be free of this terrible condition. My guest for today’s blog is the popular author, health coach and activist known as “Jim Healthy.” Jim is the co-author of the bestselling book, The 30-Day Diabetes Cure, which is the most popular and most successful diabetes-reversing plan of all time. 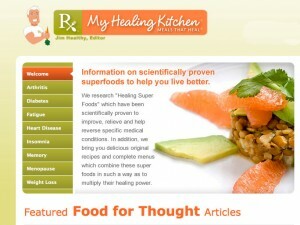 Jim is also the founder and editor of the website, MyHealingKitchen.com – which teaches his 140,000 readers about the best foods and diets for healing and reversing today’s leading medical conditions. Jim has just launched an amazing global campaign he calls “One Million Ex-Diabetics” … and he has a new book entitled Diabetes Heroes which he is giving away absolutely free to anyone who wants a copy – or who wants to send a copy to friends and family members who have Type 2 diabetes. JH: Thanks for having me, Jennifer. “One Million Ex-Diabetes” is my global campaign to reduce the world’s population of Type 2 diabetics by one million in the next 12 months. This is entirely possible because Type 2 diabetes isn’t a true disease like cancer or tuberculosis. Instead, it’s a behavioral condition that’s caused by making poor choices about what we eat and how we live. Research has found that by simply changing a few key behaviors, people can completely reverse Type 2 diabetes and kick it out of their lives – along with all those drugs. SC: In your new book, Diabetes Heroes, you describe a number of people who have reversed their Type 2 (something most people don’t believe is possible) and now are “ex-diabetics.” One of your heroes — a man named Doug whose story I saw of on YouTube — really touched my heart. But can Type 2 diabetes really be totally reversed by diet and healthy living? I’ve always heard that Type 2 diabetes was incurable. JH: I know. That’s what everybody thinks – including a lot of doctors. But there are plenty of documented medical studies proving otherwise. That’s why I’m giving away Diabetes Heroes to anyone who wants it, so they can see the proof and read the true stories of people who have beaten Type 2. SC: How is this possible? JH: Pretty easily. You see, Type 2 diabetes is caused by having too much insulin in the bloodstream. This makes your cells resistant to insulin’s effect (medically called insulin resistance) and keeps blood sugar levels dangerously high. But if you simply stay away from the foods and beverages that trigger insulin — and eat the foods that keep insulin low — insulin resistance will reverse itself … and you won’t have diabetes anymore. It’s really that simple. SC: So why aren’t more doctors telling their patients about this solution? JH: Good question. There are a number of reasons. First of all, doctors don’t agree about which dietary approach really reverses Type 2. Many believe that a low-fat diet is necessary, while others say that a high-protein diet like the Atkins plan is the solution. Still others maintain that you have to become a vegetarian – and some even favor eating raw foods exclusively. Furthermore, regardless of the diet, almost all doctors think that losing weight is the key to reversing Type 2. (It isn’t, by the way.) And they are just as confused about the best way to achieve permanent weight loss as they are about which diet reverses diabetes. Another problem is that health insurance companies won’t reimburse doctors to educate their patients – so doctors have no financial incentive to do so. In today’s healthcare system, it’s much faster, easier and more profitable to prescribe a drug. Finally, the companies who make these drugs have a lot of influence over how doctors treat diabetes. Most people don’t realize that diabetes is a $400 billion a year “industry.” If the word ever got around that the majority of Type 2s can be free of their condition and all those drugs, these companies would suffer financially. And they’re not about to let that happen. SC:So you’re saying that as long as there are some insulin-producing cells left, a type 2 diabetic can really improve their situation with diet. So, Jim — what do you hope to accomplish with your “One Million Ex-Diabetics” campaign? JH: First of all, I want everyone with Type 2 to understand they don’t have to live with diabetes for the rest of their lives — and that they’re not stuck with taking drugs forever. I want them to realize that they can kick diabetes out of their life simply by making a few easy improvements in their diet and lifestyle. And I want them to know that they can completely avoid the terrible complications that make life miserable for the majority of people with diabetes. Complications such as sudden heart attack… stroke… kidney failure… blindness… limb amputations… and Alzheimer’s disease — just to name a few. SC: I really believe in the healing powers of eating healthy and how it can change your life — especially when including everyday superfoods in your meals every day. So how will you spread the word? JH: The fastest way to spread the news about beating Type 2 diabetes is to Like our 1Million Ex-Diabetics page on Facebook. 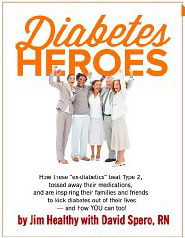 Next, everyone should download a free copy of Diabetes Heroes at www.ex-diabetics.com (or get the print edition simply by paying postage and handling). People can also send free copies to their family members and friends. Thanks to the power of social networks like Facebook, good news like this can travel lightning-fast. You and your fans can help put an end to needless suffering – and save many lives. Incredibly, they can do this with a few quick clicks of their computer’s mouse. Thanks to you and everyone reading this for helping me to get the word out. You are awesome! SC: I’m so happy to help, Jim. I’ve had family members with diabetes and I know how hard their lives are. To all my readers and fans: Please support Jim’s global “One Million Ex-Diabetics” campaign by Liking it on his Facebook page. Check out “Doug’s Amazing Diabetes Transformation” YouTube video. And don’t forget to download your free e-book, Diabetes Heroes, at www.ex-diabetics.com — (or get the print edition simply by paying postage and handling). You can also send free copies to your family members and friends. Be a hero. Let’s put a stop to Type 2 diabetes. Now!